The entertainment lighting industry didn’t need yet another USB DMX interface. It needed a Number1. The Number1 is the first hardware running Open Lighting Embedded (OLE) and designed specifically for use with the Open Lighting Architecture™ (OLA). Number1 is ideal for those wanting to control DMX/RDM devices from OLA or people wanting to test RDM equipment. For information on how to use the Number1, see the OLE User Manual. One bidirectional DMX512 ports supporting Remote Device Management (RDM, E1.20). Dual port hardware (pictured) is available on request*. DMX512 Ports are galvanically isolated to 2500V. EMI and Surge Protection on the USB Port. 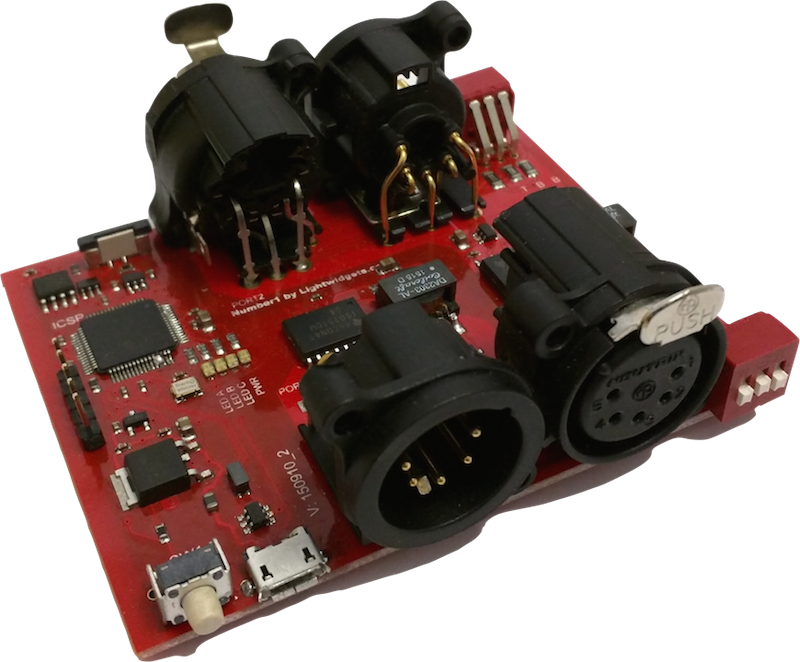 Timing subsystem allows the measurement and analysis of RDM and DMX512 signals. USB port is OTG ready, for future applications. Can be combined with a host running OLA and used as a DMX/RDM controller. Designed for use with the RDM Responder Tests. Validates both RDM data & signal timing. A dimmer, with sub-devices & status messages. Supports all RDM PIDs from E1.20, E1.37-1 and E1.37-2 standards. USB Serial Port Logging (requires Mac OS 10.7 and above or Linux). Support for Linux & Mac. *Software support for multiple ports is not completed yet. See Issue #251.